Flower Quest free game is one of more than 400 free Games you can download at Free Ride Games, With its catchy graphics and lovely background music, Flower Quest would appeal to practically anyone! Your mission in this Match-3 game is to help a young elf maiden to clear the mystic fog that has engulfed her kingdom. The locations within Flower Quest are displayed using a variety of grids throughout 50 superbly animated levels. A tile may contain either of the two items - a flower or vine. 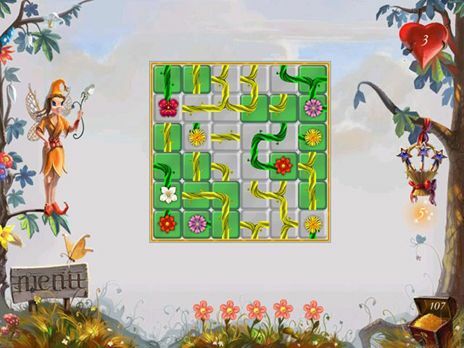 Your job is to connect the flowers by rotating the branches and remove all the tiles from the screen. Once that is done, you advance on to the next level. There are many obstacles such as locks which may appear suddenly, freezing the branches from rotating. The game also has timed levels, so if you're unable to complete the tasks before time's up, you will lose a life. An easy setting is available for new sprouts, while seasoned puzzle game fans can tackle the game at a higher difficulty setting! Download Flower Quest for FREE and enjoy: * 50 levels * Bonus rounds * Three unique gameplay modes * Easy, normal and hard modes * In-game help Free Ride Games is the only place where you can download over 300 top games for free, including Hidden Object games, Time Management games, Match Three games, Sports games, Puzzle games, Arcade games, Card games, Board games, Flash games, Fashion games, Food games, Online games, Word games and many more. We have hundreds of choices from the leading game publishers like iWin, PlayFirst, Sandlot Games, Mumbo Jumbo etc. Download Flower Quest free game and play it now.